This is a beautiful stained glass heavyweight table. It fits perfectly on the back porch as a side table with a lamp. The table easily folds for storage. This user was entered into a sweepstakes after submitting their honest review. Please allow 10 business days for the product to leave our warehouse and to receive tracking information.You should expect to receive this item within 15 business days. My experiences with products shipped from Mexico are always very well packed. The big disappointment with this table was the glass was badly cracked the first time and the reorder. Not sure what happened there. It appears the wrought iron legs were glued on to the glass and the glass cracked from pressure. I really like the beautiful table and feel bad for the poor people wrapping the package with so many bubbles. I gave the product review of 3 stars because of the beautiful glass artwork and the extra careful of wrapping. 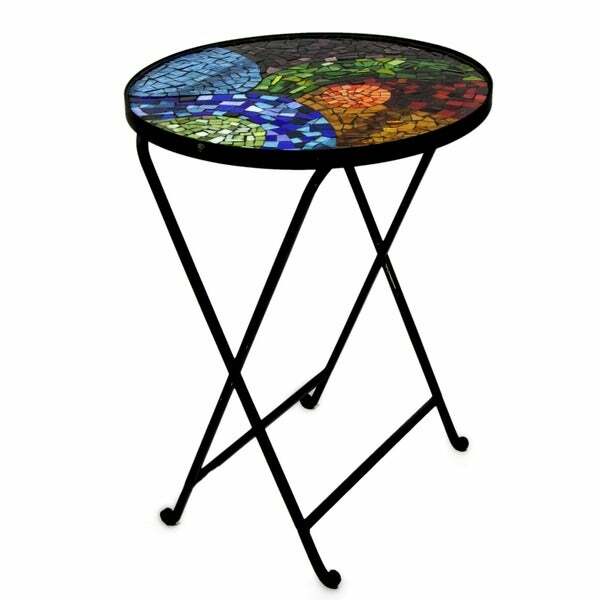 Beautiful hand cut stained glass in a myriad of strong colors in a secure wrought iron patio table. The table itself folds down for storage. The glass needed to be reglued upon arrival from Mexico so be careful when uppacking the box. I would definately recommend this creative table for anyone looking for something unique for their pool or patio area. The construction of this table was not the quality that I was expecting. Some of the glass pieces are not level and it makes placing an item on the table quite difficult. Also, the edges are irregular. The appearance of the table when the sun shines through is beautiful. This is a beautiful stained glass heavyweight table. It fits perfectly on the back porch as a side table with a lamp. The table easily folds for storage. I really like this table. Highly reccomend. This table is just what I was hoping for and the fact that it is made in Mexico by a special needs learning community is even better. It came packed very well and perfectly intact. I would recommend this table. This lovely stained glass top is placed in a skimpy frame with fold-out legs. I would have paid more for a nicer frame. The stained glass deserves it. I love the colors on this table, especially when the sun shines on it. It goes well with my other outdoor furniture regardless of the style. There’s no assembly and setting the table up was a breeze. This beautiful stained glass side table is the perfect size and design for our newly refurbished deck and outdoor furniture. Comes assembled!! A real gem. JUST BEAUTIFUL ! SHIPPED VERY SAFELY WITH LAYERS & LAYERS OF BUBBLE WRAP & CARDBOARD, SO DON'T WORRY ABOUT BREAKAGE ALL ASSEMBLED, JUST FOLD OPEN TO FIND YOUR BEAUTIFUL HAND MADE TREASURE ! I WOULD LOVE MORE IN ALL KINDS OF DESIGNS..GREAT FOR INSIDE A HOME COME WINTER AS THE HEIGHT IS JUST PERFECT & LARGE ENOUGH FOR A SIDE FOR COMPANY OR SNACKS ! I WOULD BRING IT INSIDE TO PROTECT AGAINST BREAKAGE IN WINTER , IF YOU LIVE IN THAT CLIMATE..
Beautiful table plus it came assembled which we never see anymore. Packed beautifully. Hoping for many years with this beautiful table. This table is absolutely beautiful ! It is different than anything that I have ever seen and I decided to place it next to my front door . What a showpiece !! it has bright pretty colors and enjoyable.to see it and have a cup of coffee. This table is gorgeous! It came incredibly well packed. An excellent buy. "This is an outdoor table. Will the forged iron rust ? What is your guarantee / warranty against rusting if it does happen ?" "Why is it some items are good quality and others fail? All should be shipped out in good condition??" Hello Burbey K., we agree all items should be shipped in good condition. We strive to provide excellence. Thank you for shopping with us. "How much weight will the table hold? Thanks"
The table can hold up to about 20 lbs.